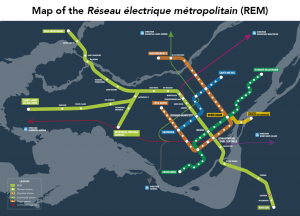 On 15 June the gouvernment of Canada confirmed an investissement of 1.28 billion Canadian dollars for the Réseau électrique métropolitain (REM), a large automated metro project for the city of Montreal. This announcement comes after the project secured funding from the two other investors: the institutional investor CDPQ Infra (2.67 bn CAD) and the government of Quebec province (1.28 bn CAD). Based on the current planning stage, once completed, the REM would be the fourth largest automated transportation system in the world after Singapore (82 km), Dubai (80 km) and Vancouver (68 km), excluding other projects such as Grand Paris, Riyadh and Doha which are planned to be longer when they will be built. The REM will have 27 stations, 13 parking facilities and 9 bus terminals. The new system, coming at an estimated cost of 6.04 billion CAD, is planned as an independent system from the existing rubber-tired Montreal Metro operated by STM, although it will be possible to connect at Bonaventure station (Montréal metro’s Orange line), Edouard-Montpetit Station (the Blue line) or McGill Station (Green line). 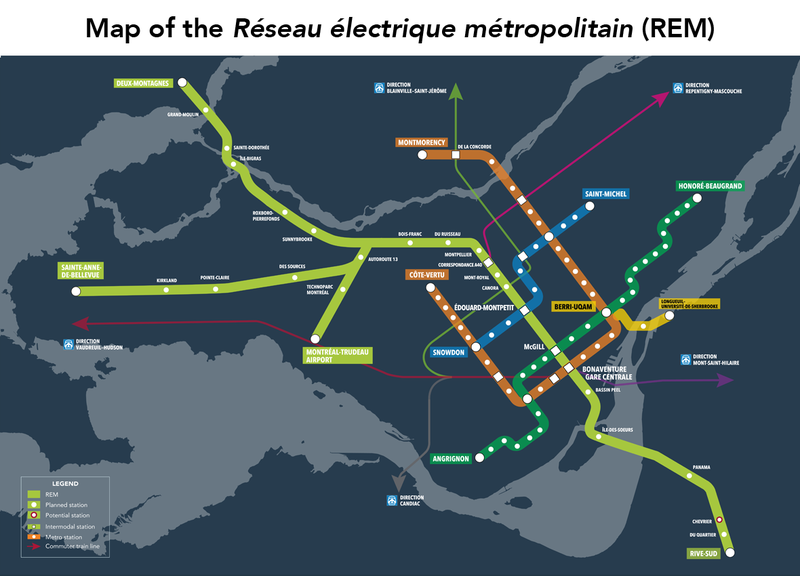 The REM project will be divided into four branches connecting downtown Montréal, the South Shore, the West Island, the North Shore and the airport, resulting in two new high-frequency public transit service lines to key employment hubs. The system is to use entirely dedicated tracks, 50% of which will occupy existing rail corridors and 30% which will follow existing motorways. Service is planned to operate 20 hours a day between 5:00 and 1:00 am, with 3 to 12-minute intervals at peak times depending on the stations. Trains will be composed of two cars (150-person capacity each) which will be coupled automatically at peak hours to form 4-car vehicles. The stations buildings will be designed with glass windows, for a focus on brightness and transparency. Other features include 80-meter-long platforms, separated from rail lines by automatic sliding doors.